An online safeguarding training course for anyone who comes into contact with children and young people during work, voluntary or leisure activities, including topics such as key legislation, how to report concerns, and indicators of abuse and neglect. Very convenient with a full-time job and family, I find it difficult it attend face-to-face courses. All info previous to assessment useful and good to be able to go back and check. Fantastic way to train, found the system very easy to use and all the information was very useful. Have done several online training packages but this is definitely the best. Our online learning management system has been built to solve the problem of maintaining central records for all safeguarding and child protection training and ensuring that everyone’s training is current and up-to-date. If an inspecting body wants to check your records, simply use our website to display a full record of staff training certificates. You can also set up automatic reminder emails to ask your users to take or retake training. You can tailor these emails and the timings for sending and you can even specify that the email appears to come from yourself. Once enabled, the training system will manage all of the chasing for you. Does this course include vulnerable adults safeguarding training? No, this course does not include vulnerable adults safeguarding training. If you work with both children and adults at risk, our Introduction to Adult/Child Protection online training is the course you will need to take. I need Level 1 and Level 2 safeguarding training. Which courses should I take? 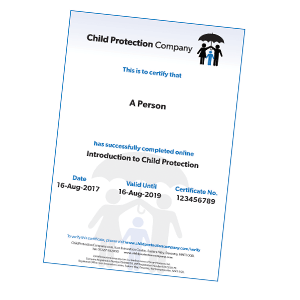 The reference to levels within safeguarding training was dropped some years ago, however, for healthcare professionals, our Introduction to Child Protection online training course is broadly in line with the child protection training requirements set out in Level 1 of the Intercollegiate Document. Our Further Child Protection online training course is broadly in line with the child protection training requirements set out in Level 2 of the Intercollegiate Document. Is this safeguarding course suitable for people who do not work in a school? Yes, this safeguarding course offers a general introduction to child protection training and is suitable for anybody who comes into contact with children and young people during work, voluntary or leisure activities. However, if you work in a school/education environment, we offer a variant written specifically for your sector, which you can select at the start of the course. Upon successful completion of the course, you’ll be able to download a personalised safeguarding training certificate valid for 2 years. This course is a basic introduction to safeguarding and child protection that will help you to recognise potential abuse and provide you with the knowledge to report the incident and take appropriate action. The purpose of this first module is to help you to assess your current knowledge of child protection. You will look at a series of scenarios that will start you thinking about some of the ways in which you could encounter potential abuse in your working day and what actions you might take in response. This module will look at what child protection and safeguarding actually mean. On completion of the module, you will have a much better understanding of key words and phrases and how these relate to safeguarding and protecting children. A better understanding of what terms such as ‘child in need’ and ‘significant harm’ mean will help you to put the language of child protection in context. Safeguarding and protecting children and young people must operate within a framework of guidance and legal procedure. This module offers an overview of this framework and how it is applied. Of course, you will not be expected to suddenly be able to quote detailed laws directly, but you will gather a general understanding of what they are. This module will also look at the organisations that play a part in safeguarding, their responsibilities and the guidelines for protection. By the end of the module, you will have a much clearer understanding of safeguarding guidance, the associated agencies and the legalities of protection. You will also see how the agencies work together to tackle the problem of abuse. Based on your initial selection, this module will take into account the regional-specific legislation for child protection training in England, Scotland, Wales and Northern Ireland. Module 4 - What is Child Abuse and Neglect? To effectively detect, reduce and hopefully prevent child abuse, we need to strictly define what it is and how it manifests itself. Understanding the categories of abuse allows us look for the tell-tale signs that it is taking place. At the end of this module, you will have a better understanding of what we mean by child abuse and what the specific areas of abuse are. Children and young people often find it very difficult to talk about the abuse they're experiencing. The anxiety they feel may manifest in different ways, such as displaying challenging or changed behaviours, and we need to recognise these signs of abuse. Abusers are often adept at covering their tracks and may appear to be very caring people, so recognising the signs of abuse can often be the first alert of a situation. At the end of this module, you will be more familiar with the definitions of abuse and the signs and indicators of the different types of abuse. The focus of safeguarding and responding to any potential abuse must be the safety of the child or young person. Remaining child-centred is vital to the process of identification and reporting, because sadly, children sometimes report several times before any action is taken. This module utilises a realistic scenario to contextualise a child-focused approach. By the end of this module, you will have a better understanding of what it means to be child-focused and how this can be achieved. This part of the course builds on the work we did in module three, where we looked at effective consultation between agencies and the increased understanding of the signs and different types of abuse we discussed in modules four and five. Children can disclose in a number of ways, so, while you want to maintain confidentiality where appropriate, you also need to know when to report and to whom. It is vital that you respond quickly and appropriately when presented with a disclosure of abuse, and this module will cover the right process to follow and what to do (and what not to do) to achieve the desired outcome. By the end of this module, you will have a better understanding of the correct procedures to follow in response to a potential abuse situation, and will know what to do if you have concerns about the behaviour of an adult. A step-by-step guide is included, which will help you to refer any concerns you may have. Using a range of appropriate scenarios, you will now take all that you have learned and apply it to an assessment of your knowledge. The final module will allow you to show how much you have absorbed and why it is so important to have child protection training. Once you have passed your assessment, you will be able to download your certificate. Your pass rate will be 70% but don’t worry if you do not pass the first time, as you can take the test multiple times. This section contains a range of useful sources of information, downloadable materials, further reading and resources that you may find useful.